Diggers Valley: 7 May 2011. The week beginning the 7th of May 2011. William, Dylan, Duncan and Lura arrived to help us tackle the tank, and we were soon joined by Kees, roaring along the track on his bike. With people and tractor, ropes and great care, we manoeuvred the tank around and down the muddy track, across the stream and out into the open on the other side, ready to head up the hill. The yellow dot in the photo indicates the tank's destination. The tractor was mainly there as a safety back-stop, so that if the tank became too heavy for the people rolling it, they could let it rest back on the padded front-end-loader bucket. We had one or two more people than we really needed, but that was far better than getting half way up the hill and discovering we didn't have enough! 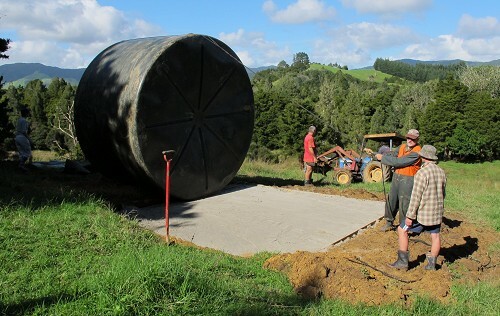 Just as we finished getting the tank into position next to the packed sand base Stephan had prepared for it, Mike, Chantelle and their three boys arrived. 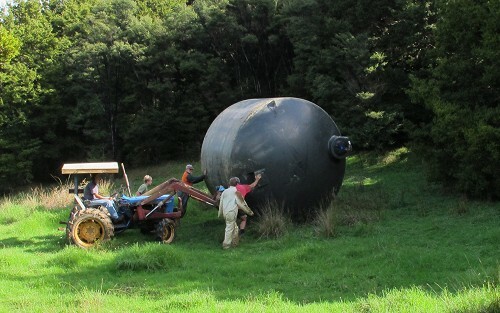 We sent a couple of those fresh helpers down the hill again to fetch a long piece of rope, with which to pull the tank over into position. As the tank landed, it bounced across the base a bit, so had to be shoved back into the middle again. So that was that: a job well done! We'd both been quite anxious about how easily this tank-moving feat would be achieved, but apart from the nervousness attending the movement of an unwieldy and expensive bit of plastic, all was well. 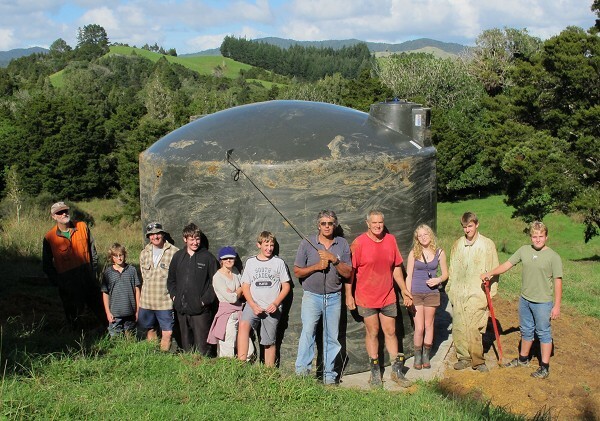 Our fabulous tank crew: William, Patrick, Mike, Eric, Chantelle, Stuart, Kees, Stephan, Lura, Dylan and Duncan. I was surprised to see a sun-glint from the top of the muddy tank! There were several suggestions about the need to wash it, but I can't really see the point. The rain will take care of the mud over the next few weeks and it's not as though we have to look at it every day. What it will need is a fence! The last week's minimum daily temperature has averaged 13.6°C (56.5°F) on a long term average of 8.9° (48°F) for the month of May, which is why there's all this fabulous grass still growing at such a pace. A few days ago there was only enough grass in here to make it sensible to break-feed the cows up the paddock, but now it's turned into young-stock feed! 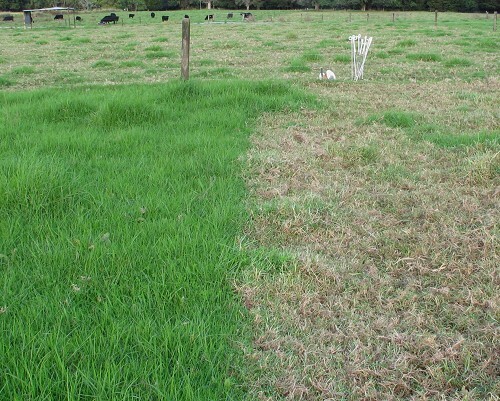 Kikuyu grass will keep growing for as long as the ground temperature remains above 10°C. The average minimum for April was 11.2° (the long term April average minimum is 10.8°C). The high temperatures have not been extraordinary, being near the monthly averages of 19° (66.2°F) for April and 18° (64.4°F)for May. Stephan started rolling out alkathene pipe this afternoon, firstly to take water up to the tank from our gravity-fed system. 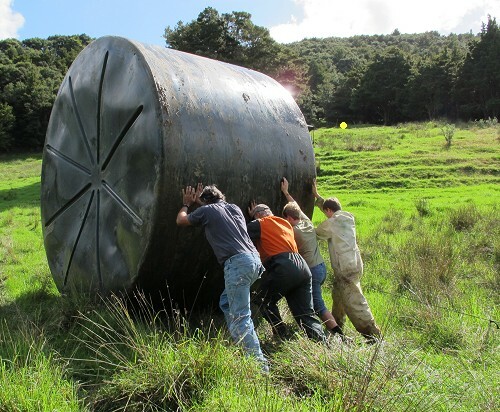 We wanted to get water into the tank as soon as possible, having heard many stories of large tanks blowing down hills in high winds when they've been left empty. 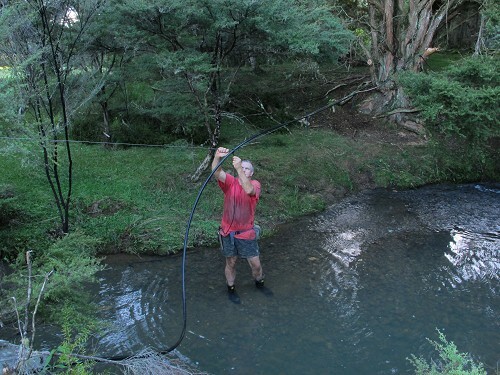 We worked out the shortest distance from the existing water lines and Stephan connected the tank's line. Then we both went up the hill, not quite sure if there was water in the pipe or not, and were delighted to hear it falling in to the tank in a steady stream. Jill (who's here for a couple of nights) and I walked up to check the tank this morning, although we didn't have to get really close to see the water level - the condensation on the outside of the tank remains to the level of the cold water inside. In the morning sunshine, the top part of the tank was quite warm and dry. This much water has taken from 5.15pm yesterday to 11.45am today. 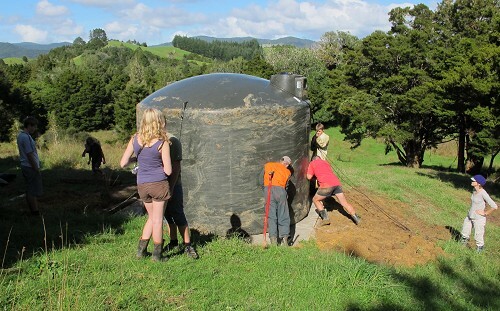 It'll take about four days to fill, depending on how much water is going into the troughs for the cattle at any time. I'm very glad the water gets up here at all! My knowledge of formulae for water pressure over distance isn't great, but because we'd had trouble getting water up one hill where we expected no trouble, I was a little nervous about this, even though the altitude measurements indicated it would work. 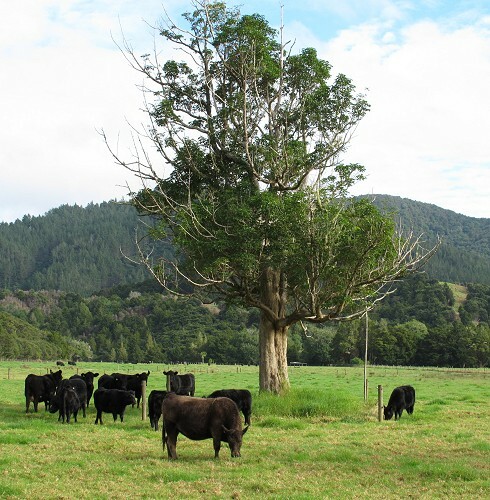 This is the 13-head mob of the last cows with calves still at foot, along with the pregnant yearlings. They're in the Flat 2 paddock. 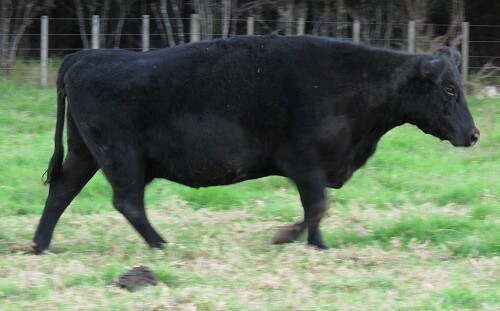 Here's young Zella, who's slightly taller than her contemporaries and quite a bit narrower across the rear, as is to be expected from her Jersey sire. Zella's now nearly four and a half months pregnant: half way through. 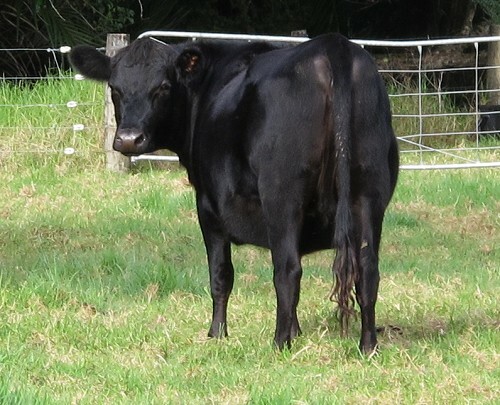 There is no external sign of pregnancy with these animals, other than a very slight change in their teat size, and perhaps a little fattening of the udder area - but that's hard to distinguish in some, from ordinary changes in body condition. I would not know Zella was pregnant just by looking at her. I could tell you I was pretty sure after three weeks, if I didn't see her on heat, but otherwise I don't expect to see any sure physical sign for another couple of months. I took Damara 74 and Emma 93 in to the yards and Stephan came and took some blood from them, so we can test for the three infectious possible causes of abortion. I have no embryonic material to provide for testing, having seen no more sign in either animal than bloody mucous in one and unusual mucous on the other. Time to mix the weaned cows back together, something I dread doing, although there's generally not too much fuss. 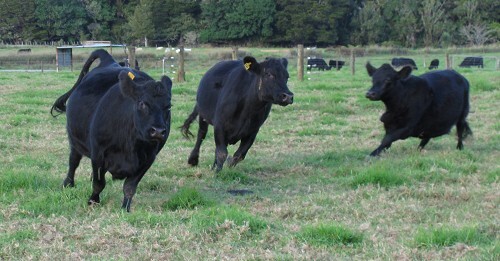 These are the mothers of the bulls and steers whose sons were weaned in the House Paddock last week. 607 and Curly 562, the two brown cows, were both in mid-leap; Ranu 31 is posturing to somebody on the other side of the fence. I was mixing three lots together in the 5c paddock. Once they were all in the paddock, distracted with a big patch of lush grass, there was a bit of mad running around, before they all settled to enthusiastic grazing. 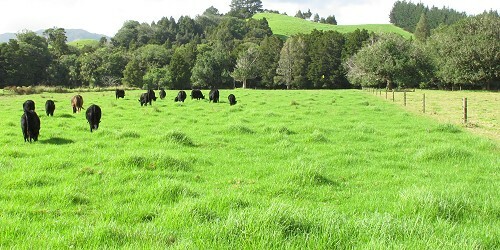 This is a corner of the 5d paddock I kept in reserve for the cows to come back to from 5c tomorrow - there's no direct route out of 5c except through this paddock, and having some tasty grass in the corner to entice them helps with moving them easily. The cows always eat about a foot's width on the other side of an electric tape, which is as far as they can reach without touching the tape and getting a shock. The deviations in the line may be where the fence standards were, or could be old manure piles. This is the level of grazing I want to achieve at this time of the year: down to where I can actually see a little bit of soil between some of the plants. 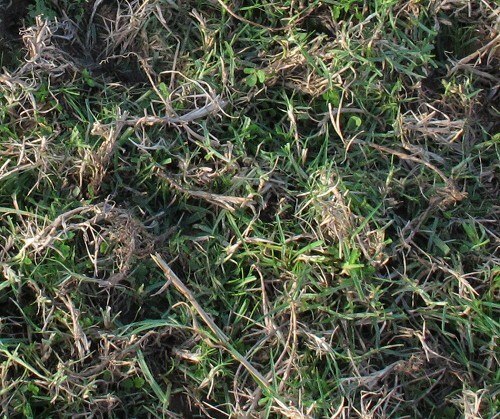 I'd so very much like to sweep or vacuum up all these messy dry bits of Kikuyu! When I looked up from my examination of the grass, I noticed some disturbance in the corner of the other paddock: Ranu 31 (on the right) was drooling and panting because she was being chased and harassed by Quanda 09. This is Madam Bully - look at that mean look in her eye! She was relentless and I was concerned enough about Ranu to want this nastiness to stop, so I got between them and fended Quanda off, until she turned and went back to the fresh grass again. But as Ranu started to wander cautiously back in the direction of the mob and the grass, I watched Quanda spot her and start marching in her direction again. It took some serious determination on my part to keep them apart! I wasn't altogether comfortable with the way Quanda looked at me at one point. Had they been seriously fighting each other, I'd not have been able to intervene, but as Ranu was trying to run away, I could deflect Quanda when they turned at one point, so Ranu could get away from her. After about ten minutes Quanda calmed down and although she continued to follow Ranu around, she wasn't upsetting her nearly as much as before. 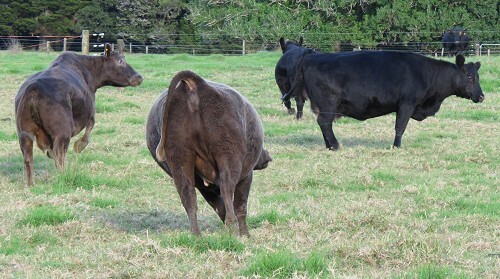 Who knows what makes one cow take such exception to another and not be calmed by the usual signs of submission in her target? I always expect and accept some fighting when cows are reunited after a period apart, but I will intervene if the victim of this sort of bullying begins showing signs of distress and the dominant animal isn't stopping. We have been aware that there are rats living under the chicken cages down by the pond - from the evidence of little piles of stolen maize under the laying box parts of the cages when we move them for the hens to have fresh grass. I also watched a large rat run out from under one of the cages one day when I moved it. 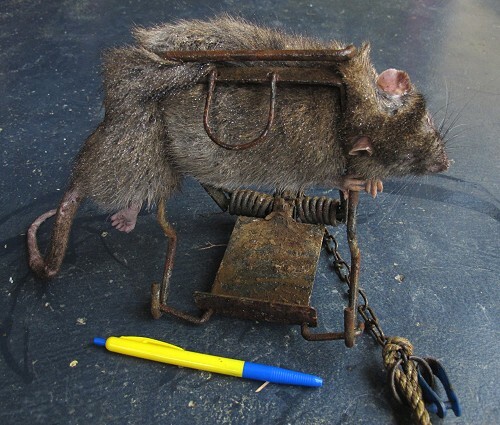 Stephan's been setting a couple of traps down there and this rat is rather larger that I expected! These Fenn traps are great, giving a fast and definite kill. The trapped rat would not have had much conscious time to contemplate its last fatal mistake. Stephan spent some of the day installing the plumbing fittings to the tank. The water goes into the tank via our usual 20mm alkathene piping. There will be a tap down by the river crossing so that we can turn off the supply to the tank if we wish to (for days when the water is dirty after rain, for instance). 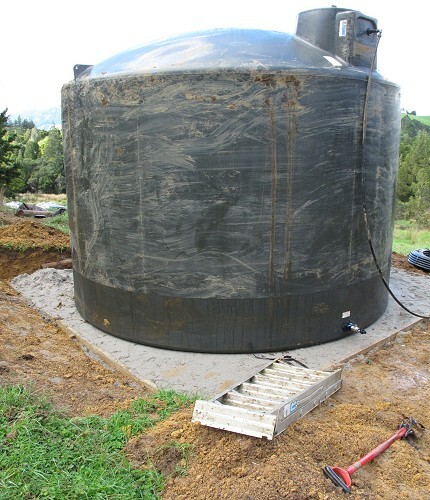 Water comes out of the bottom of the tank via 25mm pipe (1 inch), and there is a tap which will allow the tank water to flow back down the inflow 20mm pipe if we need it to, to supply the stock water troughs when the main water system is not running. The tank's still filling, so the rest of the alkathene to run the tank water to the house, is still coiled and waiting. 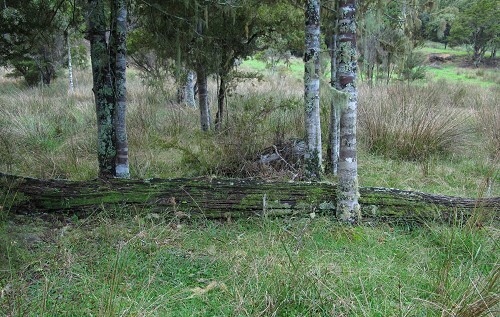 I thought this old Puriri log, lying in an open and potentially sunny part of the Camp paddock, looked a likely place for orchids. I found four or five tiny plants growing there. I wonder why there are so many young-looking orchid plants around. Why have they suddenly started appearing in these places now? I haven't found any large colonies of sun orchids anywhere, so perhaps this is a slow and steady march across the landscape from somewhere else, where they're more common? 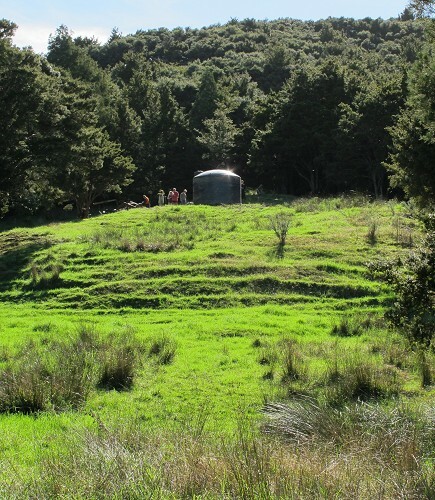 We went to town, and amongst other things bought a portable electric fence unit with a little solar panel on it, primarily to electrify the fence Stephan has yet to build around the tank. 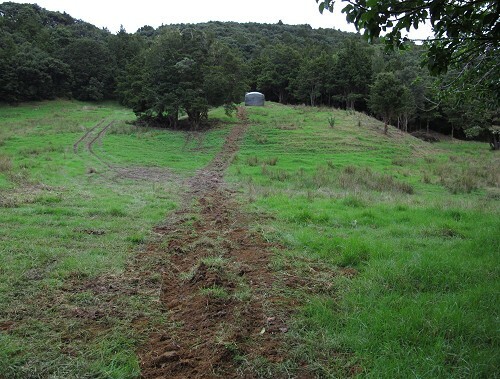 We plan some paddock subdivision which will bring the mains electric feed to the tank's fence, but in the mean time, we need to make sure the cattle don't investigate the area too closely. I also went and bought some flannelette sheets! Almost everybody I know had flannelette sheets on their beds during winter when they were children. I think because our family had all the old motel linen from the Pamir Motel when my parents sold it, we always had cotton/linen sheets, whatever the season. I remember the delightful cosiness of a flannelette nightie my mother made when I was about eight. Now I can have cosy sheets if I want to and it's delightful! On a whim (why not blow the budget completely? ), we stopped and had a light meal at the Beachcomber Restaurant and then came home and lit the fire and had dessert.